UNITED NATIONS, January 16 -- At the public UN noon briefing on Monday, Secretary General Ban Ki-moon's Deputy Spokesman Eduardo del Buey was asked, "Has the Arab League made a formal request for help to the UN?" Del Buey answered, on camera, "I don’t believe they have, no." Action returned to the UN Security Council, where a German spokesman complained to the Press that Russia's re-draft of their resolution on Syria had only just been e-mailed out, and only to the experts. Click here for that Inner City Press story. Hours later, some in the UN press corps complained that Del Buey's public answer had been superseded, but only to a few. There was an Agence France Presse story, quoting not Del Buey but a lower ranked UN spokesperson Vannina Maestracci that, "At the request of the League of Arab States, the OHCHR has agreed to train observers and will deploy to Cairo to do this training." So what changed, between the public noon briefing, which Inner City Press and other attended, and this quote? To be sure, Inner City Press e-mailed Ms. Maestracci and asked "if you said the below, when, to whom and in response to what?" She replied, "yes, at the request of the League of Arab States, the Office of the High Commissioner for Human Rights has agreed to train observers and will deploy to Cairo to do this training. You can find this information in the transcript of today's briefing." What does this mean - that Del Buey read out this answer over the UN's internal "squawk" loudspeaker, only to those journalists who were sitting waiting in their cubicles? For the record, Inner City Press has repeatedly asked Del Buey, and his boss Martin Nesirky, to ensure that after-arising answers that are "squawk" are also sent by email, to correspondents that are not in their cubicles but out covering the UN, as Inner City Press was on Monday afternoon, interviewing USG Malcorra about alleged UN negligence and death in South Sudan. 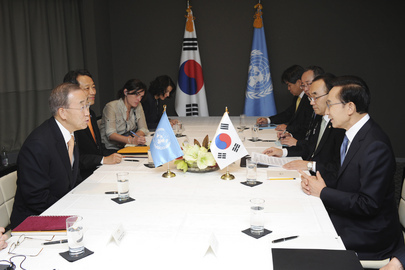 But this is what is called spoon-fed journalism, at Ban Ki-moon's UN: we'll have more on this, watch this site.